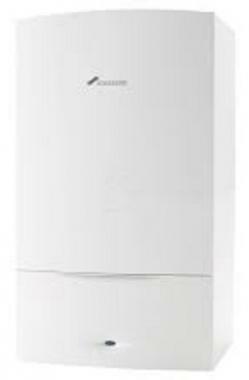 The Greenstar 30i combi gas boiler is a highly efficient wall mounted condensing model by Worcester Bosch. It’s ideal for small or medium sized homes, or those properties with one bathroom. This boiler is the replacement model for the award winning Greenstar I Junior was installed in over 1 million homes. With this boiler now including outputs that are higher, hot water flow rates of up to 12.3 litres/min, an output of 30kW and an efficiency rating of 94% it is an A rated boiler. This boiler comes with a wall mounting jig, and a pre-plumbing and rear piping as a standard with the boiler. It is a compact boiler helping it to be a low lift weight meaning that it will be a quick and easy install, plus it features a single panel front making it easy on removal. This boiler comes with a user friendly control panel making the central heating flow as well as the hot water temperature easy to adjust with simple up and down buttons. With this model also comes a wide range of accessories and options to make the boiler more efficient as well as save you money. These choices range from plug & play optional Worcester controls, to being compatible with Worcester's Greenskies. It also has the option to have a simple whether compensation helping to protect your boiler all year round. This model has a fan that can be removed with just one screw and an expansion tank that is inside the boiler. It also comes with many advantages and ways to make it the most reliable boiler by Worcester Bosch, such as a large siphon inside the boiler, helping to protect its condensate pipe from freezing. As well as this it comes with a clear text description to help get a quick diagnostic on what may be wrong with the boiler. It comes with a commissioning information to help make the completion of the benchmark checklist easier.